I have a passion for cute things and I decided that it could be cool to share with you those apps with cats that I found (It’s not? Too late). I tell you right away, I have a big number one on which I will focus! Let’s start and… Thank you Japan. 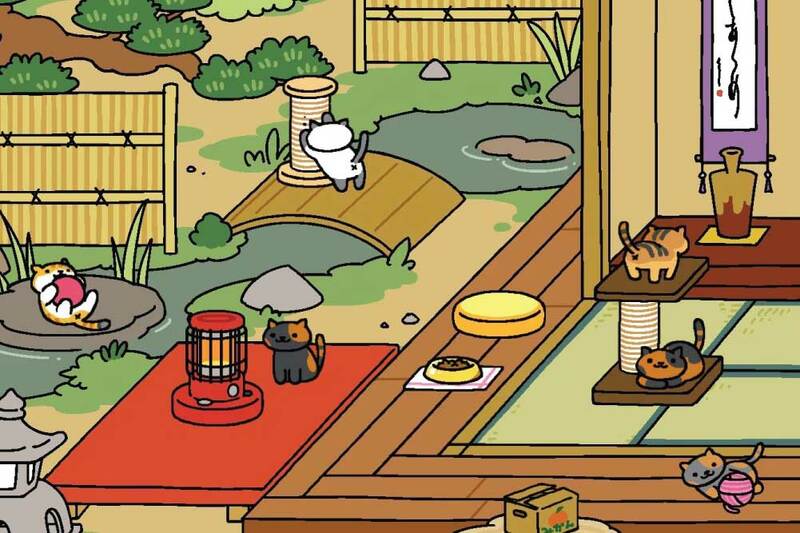 In my top 5, the first position goes to this amazing treasure: Neko Atsume. How to explain you what this game is without passing for a 4 year-old girl obsessed with cats? It’s a cat collection game. You can buy food, toys and furnitures to attract cats in your garden. You can’t do anything with them except watching them, taking pictures and receive gifts. Yep, that’s it. BUT IT’S MUCH TOO CUTE. Quick explanation: You have a garden, you leave food, cats are coming and leave you silver or gold fishes when they leave. With those fishes you can buy stuffs to attract more cats; there is no end at this game. In total you can collect 48 cats (with 16 rares) with their own name and preference. It doesn’t look like a lot here but, trust me, it’s super addictive. You don’t need to do a lot, you don’t need to play often, just pass sometimes to see what is happening in your garden and refill the food. It’s for free and it’s super cute, just try it! My original garden, look at all those happy cats! Check out the Pizzaiolo Cat! My upgraded garden, so zen! If you are thinking that Neko Atsume is useless, i’m sorry but it won’t go better! Nekonoke is a game where you just need to pet a little fluffy cat. By tapping (gently) on him, you will get furballs that you can collect o exchange for items, other fluffy cats,… It’s so much time consuming but I have to admit, I like to play it when waiting my tram even if it’s less cute than Neko Atsume! NomNomCats reminds me of the Nyan cat. It’s a platform running game. It goes super fast, there is so many colors and stuffs happening on the screen that I feel a bit on drugs when playing. You cand choose different cats, each one has unique skills (like jumping higher, breaking obstacles,…) I have to admit that I’m not that far on the game because it stresses me too much #imlame. It’s simple: Tap the cat as fast as you can to feed the Queen Cat with snacks and then you will build an entire army of cats to help you feed her. Sounds a bit creepy explained that way! This little game regroup all the superstars cats from the web like Nyan, Grumpy Cat, Garfield,… The design is quite cool, very retro. Like Kitty Cat Clicker, it’s a tap game; you need to tape your screen to open the mouth of the selected cat to eat he fishes, but not the bombs (make sense, come on). The more points you get, the more cats you will unlock! Des chats et des apps!